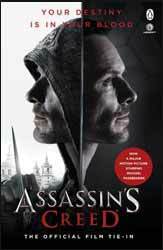 Assassins Creed: The Official Movie Tie-in novel (2017. 325 pages) is Christie Golden's official novelisation for the film, starring Michael Fassbender. The movie is based on the successful console game franchise of the same name. Like the game, the central conceit of the story is the invention of the Animus, a machine which can tap into an individual’s blood to allow that person access to their ancestors memories in such a way that they feel that they are in the past inhabiting another’s body. Without giving too much away, there is a continual war between two human factions. The Templars believe that man’s violence is such that they need an ancient artefact, the Apple, which can control free will, with this they can finally control the planet. Arrayed against them is the order of Assassins who follow a creed of free will. As usual the book has a lot more time to tell its story so you get to spend a lot more time inside the heads of the main characters which leads to a fuller experience for the reader. On the downside, the book is also constrained by the film's structure and plot. This means that there is an inordinate number of pages given over to running, jumping and fighting. This may look great on the big screen, but take this away and you discover just how slender the actual plot is. With only a relative number of ways to describe what is essentially the same action the fight scenes can get a little dull. Golden does flesh out both the plot and characters even to the extent of adding several Animus experiences of other characters which are held with Callum, which helped give the story the depth which the film lacked. In the end, it is what it is, a movie tie-in, so there is an expectation that it will be read by either fans of the story or the film. This means that there is an amount of presupposing that the reader knows something about the stories background, which is just as well as the book has a paucity of world building.